Raised Bog SAC Management Plan Site Specific Conservation Objectives and Technical Restoration Plans for the 53 SAC raised bogs are completed. 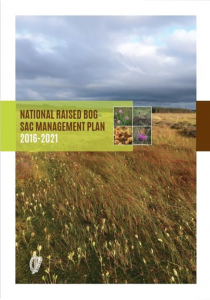 The final draft Raised Bog SAC Management Plan was presented to the Peatlands Council at the September 2016 meeting. IPCC reviewed the document and made a submission. We are awaiting publication of the document in 2017. 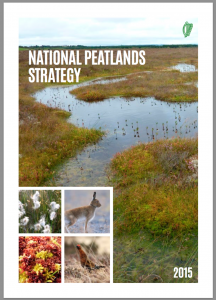 National Peatlands Strategy The completed National Peatlands Strategy for Ireland was published in 2015 and is available to download from the National Parks and Wildlife Service website from this link. 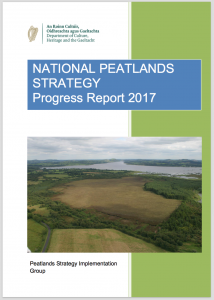 Following lobbying of Minister Heather Humphreys by IPCC we are delighted to report that the first report on the implementation o f the Peatlands Strategy was published in 2018 by the Peatlands Strategy Implementation Group. IPCC inputted to this report in the areas of education and land use planning. A copy of the report can be downloaded here. Blanket Bog SACs National Parks and Wildlife Service research is focusing at present on identifying the impacts of turf cutting on blanket bogs and pin pointing sensitive habitats. A programme for stakeholder engagement is to be developed in addition to a regulatory system for turf cutting in this habitat. IPCC have made blanket bogs a key campaign issue and are pushing for the publication of assessment reports which have been compiled by the NPWS. These are expected to be released in 2017. IPCC continue to work in this area and have written to the Minister urging her to make increased efforts to preserve blanket bog habitat. We have also launched a citizen science campaign asking users to inform us of their experience of blanket bogs. To get involved please follow this link. It is likely that a scientific research programme will be funded by the NPWS in 2017 to investigate the impacts of the various uses of blanket bog SACs and NHAs. Raised Bog Natural Heritage Areas The Natural Heritage Area network supports the designated Raised Bog SACs helping Ireland to meet the national conservation target for active raised bog of 3600ha. In 2014 the National Parks and Wildlife Service re-configured the Natural Heritage Area Network taking account of habitat quality and the number of turf cutters on each NHA site. They proposed to retain 36 of the original NHA network sites either fully or partially and to designate 25 new peatlands as NHAs. In parallel with this action the Government propose to de-designate 39 Natural Heritage Area sites in full and part of a further 7 Natural Heritage Area sites from the original network of 75 sites. New legislation to allow for the de-designation of NHAs was developed in 2016. Management plans for the sites in the re-configured NHA network of 61 sites will be developed in 2016. The last turf cutting season on these sites will be 2016. The National Programme for Government published in May 2016 has undertaken to complete this process. Owners in the new sites to be designated have still to be informed by the National Parks and Wildlife Service. There was no update on these important issues at the June 2017 and September 2018 meetings of the Peatlands Council. for Turf Cutters To date the Irish Government have paid out €20 million in compensation to turf cutters. A total of 3351 applications for compensation have been received by the Government (17th September 2018) with 484 of these indicating relocation as their compensation preference. 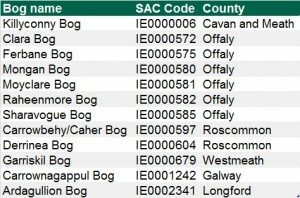 Full details of the compensation scheme for both raised bog SACs and NHAs is available from the NPWS website at this link. The compensation scheme has been running since 2011 and 15,324 payments have been made by the NPWS to turf cutters since the scheme started 8 years ago. Turf cutters have been relocated off five of the raised bog SACs to date. NPWS are also in the process of seeking planning permission to develop relocation sites for turf cutters in Galway and Kildare. This action is a public test of the policy of offering relocation as part of the compensation programme and will undoubtedly lead to concern. Raised Bog SAC Management In 2015 the European Commission approved funding for a project entitled “Restoring Active Raised Bog in Ireland’s SAC Network 2016-2020” (LIFE14/NAT/IE/000032) worth over €5.4 million under the LIFE scheme. The work will concentrate on restoring 752ha of active, peat forming raised bog habitat on 12 raised bog SAC’s in the Irish midlands and improving the supporting habitat in 2649ha of raised bog. In addition to site restoration the project hopes to deliver community engagement. This project is up and running and can be followed through its Facebook site here. IPCC are on the steering committee of this LIFE project and are meeting with the project team four times each year to hear progress and to offer guidance as needed. The sites to be restored are shown in the table below. IPCC are anxious to see management plans being written and implemented for all designated sites, not just those that are funded through the LIFE project. Energy Efficiency Scheme 2017 The Department of Communications, Climate and the Environment are to launch a new energy efficiency scheme targeted at participants in the Turf Cutting Compensation Scheme. 50% grants are to be given towards the cost of a deep home renovation with energy efficiency being the top priority. The scheme will be run by the SEAI. On the 9th December 2014, IPCC met members of the Peatland Strategy Implementation Group as part of our representation on the Peatlands Council. On the agenda was the revised draft Peatlands Strategy. The meeting was attended by representatives of all Government Departments whose work influences the conservation and wise use of peatlands in Ireland. During the meeting, the group went through the draft strategy line by line. Recommendations made by IPCC are being taken into account in the final draft. Once the document is completed it will go to Government as a Memorandum for approval and launch. This is expected to occur in January/February 2015. Chapters in the plan have been reviewed and expanded in relation to climate change, air quality, wind energy development and planning issues. In addition a time frame and review mechanism have been built into the plan. You can download pdf versions of the documents from this link or from the links above. IPCC urge our supporters to review these documents and to make your concerns known to the Department of Arts, Heritage and the Gaeltacht on or before the 18th April 2014. IPCC have made two submissions to the public consultation process in 2014. Please follow the links below to view our opinion. IPCC would like to thank all those who made submissions to the public consultation on the National Peatland Strategies. Your effort is extremely valuable and every submission helps to sway opinion. The Department of Arts Heritage and the Gaeltacht have acknowledged receipt of 98 out of a total of 1500 submissions by letter or email from IPCC supporters. If you do not have time to study the three documents above and would like to make a submission, IPCC invite you to print out, sign and post the following generic peatland strategies submission or email it to the addresses below. Thank You for your support. IPCC have been involved in the preparation of the Peatland Strategy document through our participation on the Peatlands Council since 2011. We are also familiar with the scientific knowledge that lies behind the production of the Raised Bog SAC Management Plan as we are members of the project steering committee. The review of the Raised Bog Natural Heritage Areas suggests the setting up of a new network of raised bog sites including areas that have significantly lower numbers of turf cutters. This plan will mean the de-designation of existing NHAs should it be approved. This issue needs to be examined very carefully as such a move could precipitate a serious further loss of raised bog habitat in Ireland. We will be happy to discuss your concerns with you and to provide guidance if we can to help you formulate a submission to Minister Jimmy Deenihan. Written submissions can be made directly to: The Peatlands Policy Unit, Department of Arts, Heritage and the Gaeltacht, 7 Ely Place, Dublin 2.